TV licensing laws have changed, relatively recently, and this has not helped the ongoing confusion surrounding them, especially insofar as they relate to touring, as opposed to static caravans. Touring caravans, vehicles and boats (including folding campers etc). Different rules apply, depending on which of the above we are staying away in. Although not really relevant to those of us who have folding campers and other touring units, it is important to understand the rules, as they relate to statics, as these are, often, confused with those appertaining to tourers. The simple rule for any static caravan or moveable chalet is that we are covered by the TV licence we have at home, and do not require a separate TV licence for these, PROVIDED the TV in the caravan is not being watched at the same time as the one at home. This is more common than you might imagine, with many couples going away and leaving older children, or family members, at home to look after the house, pets etc. That said, it is nigh on impossible to imagine how this might, possibly be enforceable, and seems to be on a, largely, voluntary basis. To notify TV Licencing that you don’t need a separate licence, you can download and complete a; Non Simultaneous Use Declaration Form. It is important to emphasise that this only applies to static caravans, not tourers. They must be able to be moved, either by towing or on a flat bed lorry or trailer. A fixed premises, such as house, cottage, bungalow or flat will not apply, and you must obtain a separate licence to watch TV in one of these. (Unless the item is powered by its own batteries and is not connected to either a power source or aerial point, in which case it is covered by our home licence). The rules for tourers are even more straightforward. Any touring unit (even one sited on a seasonal pitch) will be covered by our home TV licence, and will not require a separate one, under any circumstances (unless we don’t have one at home). This includes all caravans, folding campers, trailer tents, tents and motor homes. There are a couple of general, non camping specific, facts relating to TV licencing, which are, also, worthy of note. Until recently, no TV licence was required for watching catchup or streamed TV, only. This has now been revised, and a TV licence is now required to download and watch programs on BBC iPlayer. This does not apply to the downloading of programs via applications other than iPlayer. It is a common misconception that you don’t need a TV licence, if you don’t watch any BBC channels. This is not true. A licence is required to watch any live TV program. The ‘BBC only’ restriction applies only to downloaded programs, watched on BBC iPlayer. Irrespective of these two points above, the domestic TV licence we hold at home will cover us for all touring units, and, provided we have one in our main house, we will NOT require one for watching TV, of any kind, in our folding camper, caravan etc. If you want to check out the specific criteria for requiring a TV licence, you can do so in the Do You Need A TV Licence section of the TV licencing web site. This week, the Motorhome & Caravan Show, at the NEC, saw the show debut for Safari Trailers & Campers, and the entry level offering from Echo 4×4 Centre; the Echo 4, an innovative trailer tent model, originating from South Africa. Other models in the UK range include the Echo 5, Echo 6 and flag ship model, the Kavango. The company does produce smaller models (Echo 1 – 3) but they aren’t, currently, imported into the UK by Safari Trailers & Campers. According to the Safari Trailers & Campers company web site; “The ECHO 4 is an extreme off-road camper and a step up from the conventional off-road trailers. With enhanced features, such as ample storage, dust sealing, water capacity and weight distribution, this trailer is a reliable addition to the 4×4 enthusiast. This rugged off-road trailer is known for its comfort and its ease in towing, making it one of the ultimate campers to suit ANY wilderness adventure. Tried and trusted, the ECHO 4 remains a favourite for the serious outdoor explorer”. Not too much to add to that, I don’t think. The Echo 4 is a two / four berth trailer tent. Like all of the Safari range, it is top end, both in terms of price, but, also, in terms of quality and attention to detail. The whole tent opens out from the trailer, leaving the main double bed in place. This creates a spacious living area to the left of the camper (looking at it from the front). To the right, is the kitchen area. This can be protected from the elements with either a short awning canopy, or a full length, two metre canopy, as seen in the picture above. One of the great things about the Echo 4 is that its accommodation is modular. The main living area, itself, can be adapted and extended, using a series of velcro attachments. The basic unit comes with the Add-A-Room extension included. This annex will sleep a couple of adults, or three children. It is, also, possible, to add a large toilet compartment on to one of the side doors, using the same velcro type attachments. The kitchen is typical of this style of trailer, but comes with all required fittings and accessories, as well as a load of dedicated storage. The Echo 4 is an extremely rugged design, built with the intention of off road usage. It features a hot dipped zinc galvanised chassis, electro galvanised body and military standard rip stop canvas. Folded, the trailer is 133cm long, 104cm wide and 90cm high. When opened up, on site, it extends to 371cm long, by 180cm wide and 153cm high. The trailer, itself, weighs 445kg. The list of items included with the unit is comprehensive, to say the least, and is covered below, however, it does come with a pretty hefty price tag, of £13,495, including VAT. Initial reaction is that this is one cool trailer. It is designed for off road use, and it has that rugged look you associate with this style of trailer. The trailers are built by Echo 4×4 Centre, in South Africa, and imported into the UK, by Safari Trailers & Campers. The basic trailer is unhitched, and wheeled into place. It is then opened out, leaving the bed in situe on the top of the trailer, with living area to one side, and kitchen area to the other. Main Bed Area With Ample Storage Below. You Won’t Get A Much Better Vantage Point To Wake Up In. The bed, itself, is very elevated, and can only be accessed via a ladder inside the main living area. Once in the bed, however, the views can be quite exceptional, with a window on three sides, and elevated position. Underneath the bed is a wealth of storage space, which is extremely well organised, and can be accessed from either the kitchen side, or the main living area side. The bed, itself, even, comes with a fitted sheet and matching pillow cases. There is, also, a table / work surface on each side, and a number of well organised drawers (six per side). The living area has a built in ground sheet, and is well insulated, for colder nights. The Add-A-Room annex adds additional sleeping space for two adults, or three children, and attaches to the end of the living area. There is, also, an optional add on toilet compartment, which attaches to the side of the living area, if required. On the other side of the trailer is the kitchen area. This can be covered with the shorter canopy, for cooking only, or the larger, two metre canopy for a little extra sheltered space. The kitchen, itself, is very comprehensively equipped, although cooking and washing facilities are quite basic (as is, often, the case with trailer tents of this nature). The kitchen unit is, actually, contained within the main trailer unit, and, simply, pulls out from there. It is comprised of comprehensive storage, with accessories, a cooker, and washing up bowl, with drainer. The cooker is, simply, a two burner gas hob, with wind shield, and the ‘sink’ is a plastic bowl which drops into a frame at the side of the kitchen unit, in much the same way as the Camp-let models do, however, in this case, the Echo 4 has the added advantage of a matching slot in drainer, as well, but not a tap running directly into the ‘sink’. Where this model really excels is in the utensils it includes, and the dedicated storage provided for them. In the picture, above, from left to right, we have the main compartment door, with cutlery rack attached. Next we have the first four storage drawers, with compartments for cups, glasses, plates etc, work surface with cooker over, two further drawers behind and sink / drainer to the far right. There is, also, a power management unit behind the cooker. Whilst the cooking and washing facilities are, somewhat, basic, the list of cooking equipment and utensils is pretty comprehensive, and includes; 6 Plates, 6 Side Plates, 6 Bowls, 6 Mugs, 6 Whisky Glasses, 4 Wine Glasses, 6 Knifes, 6 Forks, 6 Table Spoons, 6 Tea Spoons, 6 Steak Knifes, 1 Bread Knife, 2 Smaller Knifes, 1 Bottle Opener, 1 BBQ Tong, 1 Salt & Pepper Set, 1 Cutlery Bag and 4 750mm Bottle Holders. There is a compartment for a fridge, two jerry cans, as well as a gas compartment and 100 litre water tank, with tap. There is an on board mains and 12V system and gas locker. There are, also, 3 LED lights, and, in the living area, there is what is described as a; ‘vanity compartment’, which includes a number of additional drawers and a series of hanging compartments, with mirror. One thing this year’s Motorhome & Caravan Show did confirm is that there is a definite trend toward the more rugged ‘adventure’ style of trailer tent, particularly the demountable ‘tent on a trailer’ style, like the new Trigano Qztrail Quest 500, Quest 700 and Zenith models. The Echo 4 takes this to the next level. Although styling and equipment levels are very different, the Echo range appears to be very much targeted towards the Holtkamper type of customer, insofar, as it is at the top end of the price bracket, but with build quality, performance and design to match that price tag. Also, like the Holtkampers, it has one raised, fixed double bed, with further berths being provided by way of ground level annexes. Cooking and washing facilities are basic, but attention to detail is high and this model will be equally at home on the camp sites of the UK, as it will on the plains of South Africa. With a very rapid basic set up time of under 10 minutes, it will, also, appeal to the Combi-camp and Camp-let market, as well, albeit with a somewhat higher price tag. Don’t forget, for more discussions and advice, we now have our own Facebook Group, so feel free to check that out, as well. This morning saw the opening of another Motorhome & Caravan Show at the NEC, and, as usual, I was there on the opening day, to take a look at what was on offer. The show is the UK’s largest motorhome and caravanning event. It is also the one opportunity in the year for the public to see all of the new 2017 caravan, motorhome, holiday home, folding camper and trailer tent models from the leading UK and European manufacturers. The show was first launched as a National Caravan Council (NCC) event, in 2011, and is supported by industry members, as well as the Caravan Club and The Camping & Caravanning Club. Along with its sister show; The Camping, Caravan and Motorhome Show, it accounts for some 20% of total UK sales of caravans and motorhomes each year. With over 350 exhibitors, across 11 halls, it offers the widest possible choice, all under the one roof. The show was opened, at 10am, by Olympic cyclist Sir Bradley Wiggins. An ambassador for Swift Group, Bradley will also help them launch their new for 2017 models that will make their world debut at the show. There are a number of other celebrities attending the show, through its duration. Full details of these are available on the Show’s Web Site, and in the Celebrities link below. The caravan industry employs more than 100,000 people in the UK, including seasonal staff. 95% of caravans and 75% of motorhomes seen on UK roads are actually manufactured in the UK. Whilst on holiday, caravanners, generally, spend £2 billion in the UK alone, thereby helping to support local businesses and attractions. The Show covers 11 halls, and, as mentioned above, is the largest UK motorhome and caravanning event. When I arrived, at 8am, I gained entry to the show via the Press Office, in Hall 18. My initial destination was the Pennine stand, in Hall 12, and it took me a good 15 minutes, at a brisk pace, and with no one around, to walk straight to it, via the various halls, so this is no small show, and every hall is jam packed with caravans, motorhomes, camping clubs and venues and, of course accessories. It would be very easy to lose yourself for a good couple of days, if you wanted to take a look at everything on display, and that is something that is much easier to do, if you choose to make the most of the on site camping facilities. I could have taken advantage of the 90 minute guided tour, provided for members of the Press, but I was keen to get to Hall 12, to check out the part of the show I had, mainly, come to see. Tickets this year were £8.50 in advance, and £12 on the door (OAPs £11 on the door, and children under 16 free). This is the same as last year, and is still excellent value, bearing in mind it includes entry to the show, full show brochure and parking (Car parks were marked as £12 parking charge, so the total price seems pretty reasonable over all). This price also includes access to a number of free events, and, of course, the free towing experience. As usual, refreshments are not so cheap, but there is a huge choice of food and drink on offer, should you feel the need. The 2014 show was covered in quite a bit of detail, in our article; Motorhome And Caravan Show 2014 Opens At The NEC and all main aspects of this show remain pretty much the same, as they did, also, last year. One question that always crops up at this time of year is; “Will I get a load of bargains at the show”? To be fair, the answer is, probably; “No. Not particularly, especially if you are looking at buying a caravan or motor home”. As mentioned above, some 20% of total UK sales are made at these shows, already, and, for some, waiting lists can be quite extensive, so there is no major incentive to provide huge discounts and offers. Be wary, also, that some ‘show specials’ are, actually, not much, if at all, different from what you can get outside of the shows. That said, there are bargains to be had, and, nowhere else, will you find such a massive selection of models, accessories and services. It has to be worth a look, if only to get a feel for what your options are, and, who knows, you might just pick up a bargain or two, as well. If you are thinking of going, then, if it is an option, Wednesday to Friday are, potentially, your best days to do so. Tuesday tends to be busy, as it is the opening day, with additional activities and events, and Saturday and Sunday can be manic, for obvious reasons. If you did want to stay, there is an on site camping area (see link above). There are some 400 temporary pitches available on site, mixed between hard standings (@£35 per night) and shingle (£30 per night). A free shuttle bus, to the show, is provided, but entry to the show is not included. Camp site facilities include 6A electric hookup, fresh water, grey and dry waste disposal and toilets (no showers). There is, also, entertainment, every night, with food and bar within the main entertainment tent. Just like previous years, the trailer tent and folding camper stands were all located, together, in Hall 12. Again, there weren’t that many of them, relative to the size of the show, but their close proximity to each other made it easy to check them all out together. Although this show is larger than sister show the Caravan, Camping & Motorhome Show, the trailer tent and folding camper section is smaller, with notable omissions from some manufacturers, such as Holt Kamper and Cabanon, but the majority of current models are still represented there. The main exhibitors at the show were Pennine and Opus on the folding camper side, and Black Country Caravans, Burcroft Camping and Camperlands on the trailer tent side. however, there was a new addition, to the exhibitors list, this year, in the shape of Safari Trailers & Campers, designed for the more adventurous camper, and originating from South Africa. In fact, there is a marked shift in design, this year, amongst the new models with a definite trend towards the more rugged ‘adventure’ style, represented by the Trigano Oztrail range, the Safari Trailers range and the Venter Trailers Savuti Offroad. Venter Trailers, also, have a small stand in Hall 6, but not large enough to set the tent up, however, they have invited me down to their Bristol premises, for a demonstration of the model, and I will do a full review, once I have had the opportunity of doing so. The Oztrail and Venter models are mounted on a standard trailer unit, which can be used, without the tent for the rest of the year. Below is a very quick summary of some of the items worth taking a look at. The Odyssee is now split into two models; the older 2012 model has now been re branded as the Odyssee Basic. On the other hand, the re vamped 2014 model has now been re branded as the Odyssee Plus, and has a number of additional features and equipment. The ‘Plus’ on the other hand, is a re branded 2014 model, and comes complete with kitchen and ‘sun roof’. There is a slightly different colour scheme for 2015 and 2016, and minor changes to the front panels, but, otherwise, it is pretty much as the original 2014 model. The kitchen on the Odyssee Plus is a good sized unit, offering a two burner hob / grill, sink, and ample storage. Like the ‘Basic’, it offers comfortable four berth accommodation, with under bed storage below one of the beds. Unlike The Basic, The Plus Features A Couple Of Roof Lights. More details of the Trigano Odyssee can be found here; Trigano Odyssee Model Details. 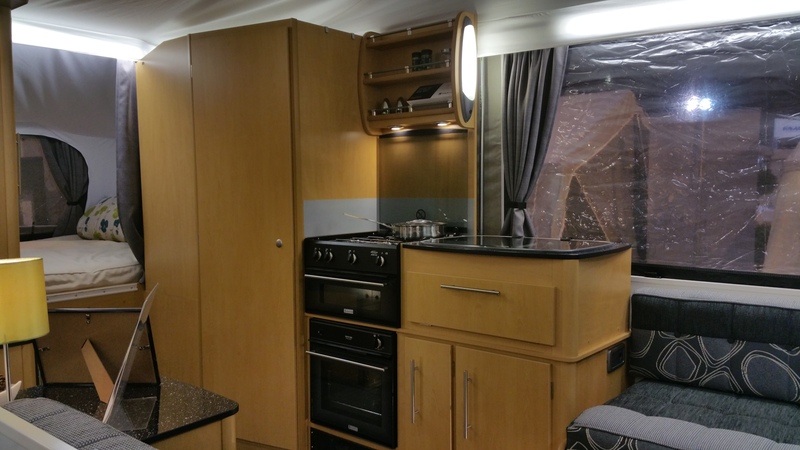 The Galleon is another four berth model, with a distinctive curved canopy roof. The Galleon is a more traditional trailer tent style, offering two under bed pods (unlike the Odyssee models described above). It also comes with a large kitchen unit, like the Odyssee Plus. The kitchen in the Trigano Galleon is different from the Odyssee, however, with a sink and a three burner hob, as opposed to a two burner hob and grill. The Trigano Alpha is a Two berth model, in the Combi-Camp Style, with fold over trailer cover that forms the floor of the sleeping area. The Alpha, although two berth, comes with a pretty impressive specification, with full kitchen, and large awning / living area. The kitchen includes a sink, two burner hob with modern grill and plenty of storage. There is also a central area for a table top fridge. The bedroom is spacious and comfortable, for two, and, new for 2015 /16, is an annex that attaches directly to the bedroom area, to double the number of berths, in the same way as the Cabanon Malawi and the Combi-Camp models. The Olympe really lives up to its name, and is absolutely huge. 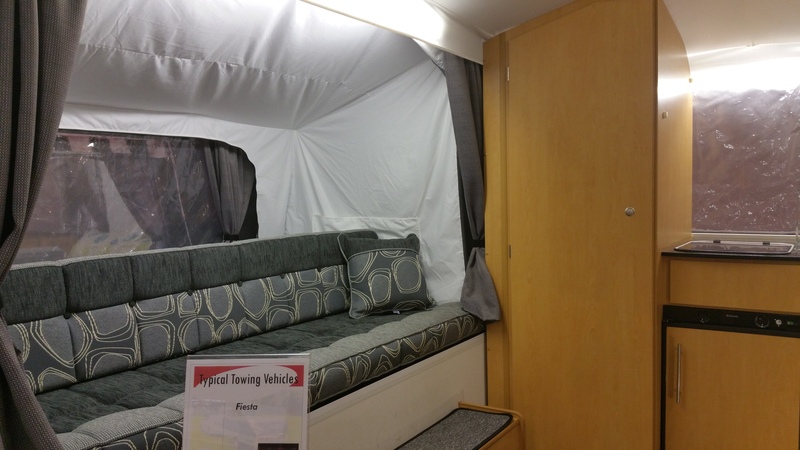 With optional awning annexe and under bed pods, this model will actually sleep twelve people. The three main double beds are contained within three pods at the rear of the awning. I was really pleased to see that the centre pod, has reverted back to the pre 2014 specification, and, now, contains a seating area, once again, rather than just an empty storage area. This seating area can be converted to an optional double bed, as well. The kitchen unit in the Olympe is the same as that in the Odyssee Plus, with two burner hob, grill, sink and storage compartments. Full details on the Olympe can be found here; Trigano Olympe Model Details. Camp-let offer three main models, all of which were represented at the show, on the Camperlands stand. The first of these is the Basic / Basic +. This is an entry level model, but with a fairly impressive specification, and, of course, the trademark rapid set up of the brand. The main difference between the two models is that the Basic has no kitchen, whereas the Basic + features the same kitchen unit as the Classic. The Classic is almost identical to the Basic / Basic +, and, even, the dimensions are the same. The Premium is the top of the range offering, from Camp-Let. Although the same width as the other models, it’s 43cm deeper, and, unlike the flat front of the Basic and Classic models, the Premium has a peaked roof, although it does share the dual aspect of the Classic. The only other noticeable difference is the the kitchen is a little plusher in the Premium than the other models. Although it still lacks a proper sink, it has more draws / storage compartments than the more basic unit. The Solena is Raclet’s smallest and quickest erecting trailer tent, and was on display on the Burcroft Camping stand, along with Raclet stable mate; the Quickstop SE. Although a lot smaller, and with more traditional awning, the Solena is a similar style to the Trigano Alpha, referred to above. It also incorporates an annex (this time attached to the awning) thereby allowing the sleeping capacity to be double to four berths. Raclet Solena Model Details. The Quickstop has always been a bit of a hybrid; part trailer tent, and part folding camper, although it’s probably fair to say that the latest Quickstop SE is pretty firmly in the latter camp, as the level of equipment contained within the main trailer is increasing all the time. However, we are looking at it here, with the trailer tents, alongside smaller sibling the Solena, purely for the sake of convenience. The Quickstop SE is, to all intents and purposes a folding camper. The main trailer area contains not only two beds and two comfortable settees, but, also a proper kitchen, with sink, hob and stylish grill. There is no three way fridge in the Quickstop SE, but there is space for the table top fridge, adjacent to the main kitchen unit. One aspect that still pays homage to the Quickstop’s ‘hybrid’ heritage is the removable kitchen, which can be lifted out, and used, free standing, in the main awning area. At this show, two kitchens have been set up, to show both locations. The Campmaster Air is something that little bit different. Developed for Camperlands, it is a small, compact trailer tent that can be towed by the smallest of cars, or, even, a motor cycle. The concept is pretty unique, and very ingenious. Contained within the trailer is a modified version of the Vango Eden 400 Air Tent, which inflates in a matter of minutes. You then push the trailer inside, open it out, and you have the base for your double bed. The Air even includes a separate toilet / changing room compartment, next to the bed, and adequate living space in the main tent area. All this in a trailer with a fully laden weight of just 200kg. Campmaster Air Model Details. 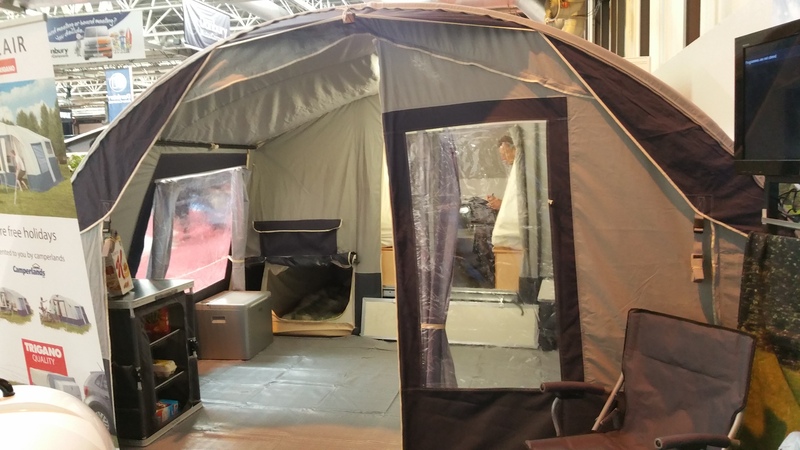 Tucked away in the corner of Hall 12, next to the Trigano Oztrailn Quest 500, we find the Trigano Camplair, another 4 berth trailer tent, with a curved roof, along the lines of the Trigano Galleon above. The Camplair is a budget trailer tent, coming in at comfortably below £3,000, and, as such, has no kitchen unit, but it is designed to be extremely easy to erect, and can comfortably be set up by one person, using its single hoop awning system. Continuing the adventurous theme of the Oztrail range is the Safari Trailers range of rugged trailer tents, originating from South Africa, and making their debut at the show. There are four models in this range, the Echo 4, Echo 5, Echo 6 and the Kavango. The smallest of these, the Echo 4 was on display. I will be doing a detailed review on this, shortly, however, for now, here are a few pictures showing just how different it is. In addition to the Raclet Quickstop SE, mentioned above, there are only two other folding camper manufacturers in the UK / Europe, both of whom are represented, here, at the show. Pennine continues to be the fore runner in the UK folding camper market, and they had all four Conway / Pennine models on display at the show. Three of those are permanently set up for viewings, whilst the fourth, the Conway Crusader, is used for regular demonstrations on the setting up, taking down procedures. Also on the Pennine stand was the new Air Porch 6 awning. All of the models come with the new 2016 livery, which includes some excellent new soft furnishings, blackout curtains, and work tops and table, in a black granite effect, with silver fleck. The Countryman is, effectively, the entry level model, and is the only one in the range without its own onboard toilet compartment. That said, many people actually prefer a camper without a toilet so close to the main living area, and the Countryman caters very well for that section of the marketplace. The Countryman offers comfortable four berth accommodation, with two fixed double beds, and two fixed dinette style settees. Due to the lack of toilet compartment, the kitchen in the Countryman is well equiped and spacious for a four berth model. Conway Countryman Model Details. The Fiesta is built on the same trailer base as the Countryman, but approaches the accommodation in quite a different way. As you enter the camper, the first, and most obvious difference is the introduction of a toilet compartment in the front left hand corner, adjacent to the kitchen. Whilst this toilet compartment is a welcome addition to many, it is at the expense of the kitchen area, which, inevitably loses a storage cupboard and a degree of workspace. The other difference is the clever way the Fiesta creates extra space in the main living area. The Countryman has two fixed opposing settees, with two fixed beds behind. This makes dining for four very easy, but eats into floor space. The Fiesta gets around this by using one of the beds to make up the second settee. On the plus side, this creates a lot of extra floor space, but the trade off is that the second bed has to be made up, at night, and the settees are a little farther apart when it comes to dining comfortably. Pennine Fiesta Model Details. 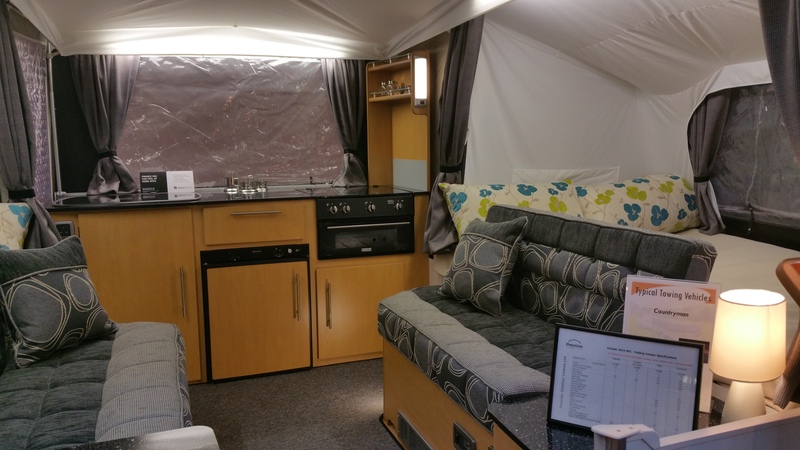 The Pathfinder is the flagship model in the Pennine range, with full wash room, including toilet and wash basin, full oven and a large lounge, with U shaped seating. Above, we can see the comfortable and spacious accommodation in the Pathfinder, with all 2016 refinements, plus wardrobe, king size bed, toilet / wash room, comprehensive kitchen and seating. The U shaped seating is unique to the Pathfinder model, and offers a comfortable and spacious area to dine and relax. Pennine Pathfinder Model Details. The Crusader is a show special, and doesn’t appear on the company web site. It is based upon the Pennine Pathfinder, and is built on the same trailer. It does, however, incorporate some small but subtle differences. The most significant of these is the seating arrangement. There is no U shaped settee, but, instead, the more traditional opposing settee style dinette seating. In between these is a fold up occasional table. Also, because the seating is slightly shorter, this accommodates a larger cupboard between the door and the settees. Conway Crusader Model Details. That’s about it for the trailer tent and folding camper aspect of the show. Of course, these are not intended, in any way, to represent detailed reviews, simply to give an idea of what’s available to view at the show. Trailer tents and folding campers may be limited, but there is loads to see and do at the show, loads of accessories, both camping related, and not, and, if you are there to look at the caravans and motor homes, be prepared to be lost for a very long time. There are plenty more walk through videos from previous shows, and from projects we have worked on. You can check those out at our Youtube Channel. To date, my original article, and subsequent ‘Definitive’ guide to towing in the UK have received well over 250,000 views, however, it is clear from ongoing, online, discussions, that this is still a hugely misunderstood topic. To this end, I have decided to both expand the original guide (to cover those aspects that may have been omitted before, such as nose weights and the implications of fitting towing mirrors when not towing, or when the towing vehicle is wider then the caravan, itself) whilst, at the same time, attempting to simplify and further clarify the core messages of the guide. If you have any concerns, misconceptions or questions, appertaining to towing legislation, or if you just want to know what it’s all about, then it might be worth taking a look at the new Layman’s Guide To Towing In The UK. The vast majority of us will have some form of on board electrical system(s) in our units, be it 12 Volt, 240 Volt, or both, however, it is apparent that many users still don’t fully understand what systems power what appliances, and we regularly receive enquiries from people concerned that their three pin mains sockets aren’t working when there is no electric hookup (EHU) or from those unable to understand why their fridge won’t work on 12V, if there is no mains supply. A 240V Mains Socket Will Not Work Without EHU. Most modern units will have two different electrical systems, a 12V system and a 240V system, however, it is more than likely, both systems will be inter linked to a greater or lesser extent. What System Powers What Appliances? Starting with the 12V system, this will, most likely, be powered by an on board leisure battery. For more information on how these work, see our earlier article; An Introduction To Leisure Batteries. Please note; the 12V supply will NOT power the three way refrigerator, where fitted. This is because it would drain the battery in a matter of hours, or, even, less. Many fridges are not, even, connected to the leisure battery, for just this reason. More modern fridges do tend to be connected to the leisure battery, but not for cooling, only to power the light(s) and electronic ignition. The 12V setting on a three way fridge is only for use when connected to a towing vehicle, and, then, only when the engine is running (an on board relay will, normally, disconnect power to the fridge, as soon as the car engine is turned off). In some units, there may, also, be mains lighting, as well, although this tends to be more the case with caravans, as opposed to folding campers. How Do The Systems Work, In Practice? The way the electrical systems work will, in the main, depend on the age of our unit. The very oldest units may well have no electrics, whatsoever, relying on manual foot pumps for water, and gas for cooking and, maybe, a fridge, if you’re lucky. Slightly newer units will, often, have one system or the other, but not both, although you will, often, see one, or the other, or both, fitted as an after-market installation, by subsequent owners. If the on board electrics are 12V only, this is fine, but does present us with one significant challenge; how do we charge the leisure battery, without a mains supply? Of course, these days, we have various options, such as solar panels etc, but the original answer, usually, came via the grey 12S lead, connected to the vehicle tow bar electrics. This gives us the option to charge the leisure battery, whilst in transit, but, of course, is not ideal, for longer stays, when the car may need to be hooked up, for a while, in order to top up the leisure battery. Some models, actually, take this a step further, and use the vehicle battery to power the camper’s on board 12V system, thereby excluding the need for a leisure battery, at all. This is not ideal, as you need the car to be permanently connected, in order for the 12V system to work, but a surprisingly large number of models did, still, use this system. On units with 240V power, only, there is no such issue with charging the battery, although, of course, there can be a bit of an issue, when visiting sites without electric hookup facilities. So, of course, the ideal scenario is to have both systems installed, and, for the vast majority of modern units, this is the way they are configured, thereby enabling us to operate reasonably well, wherever we may be situated. This unit, also, contains all fuses / trip switches for both 12V and 240V systems. The PSU provides a bridge between the 12V system and the 240V system. It allows the mains supply to charge the battery, but, also, allows the 12V system to run, even without a battery in place. Whilst this facility is available, and can be used in the short term, it is not recommended for long term use, in most units, as the battery is not only used for storing 12V power, it is, also, used as a buffer, smoothing out the power supply from the transformer, and protecting any in line appliances from damage. Having a dual electrical system really is the best of both worlds, with the facilities needed to charge the battery, whenever we are on EHU, and the backup of a leisure battery when we aren’t. We looked at the general topic of working without EHU in our earlier article; Making The Most Of Life Without Electric Hook Up, but, for now, we are just looking at the specifics of what will, and won’t work, when we have no external mains supply. All of these contain a heating element, rendering them unsuitable to use on 12V, which is why many come with a gas option. If they don’t, then you will be unable to use them without electric hook up. Unfortunately, all new model folding camper models, from Pennine, are provided with electric only heating / hot water, and only UK competitors, Opus, have electric only heating, and no hot water system, at all, so off grid camping, in modern units, can be a little more of a challenge. Of course, if we are staying away without electric hookup, for any period of time, we may well require some form of battery charging facility. The most popular of these, today, is the solar panel. An 80W plus model should give you all you need for moderate to average usage over extended periods. If you do need a little 240V power, whilst away, without EHU, this is achievable with the use of an inverter. This converts 12V power to 240V, for running the odd domestic appliance. Of course, we need to be mindful of the power usage of those appliances, and, once again, anything containing a heating element will kill the battery in a matter of hours, or, even, minutes. Consequently, it is best to keep to inverters of no more than 300W, in order to protect battery life. This week, Opus announced the forthcoming launch of their latest model, the AirOPUS, so I thought now would be an appropriate time to do a review of this innovative, and inherently cool, camper. 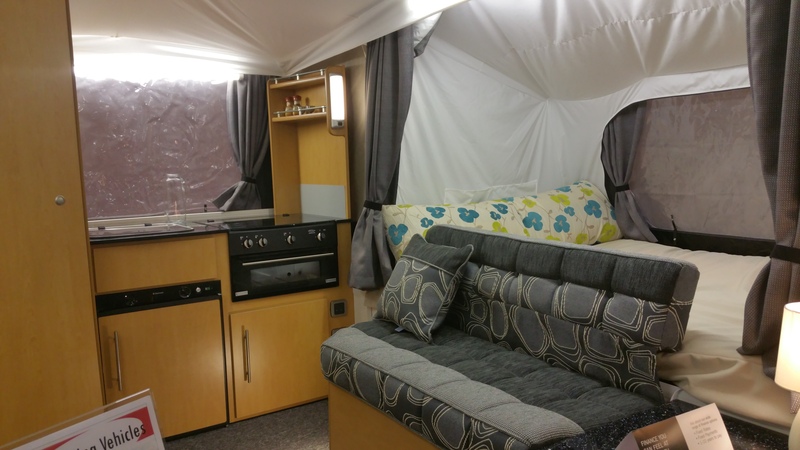 The Opus Camper first gained mainstream recognition when it appeared on the television show; The Apprentice, in 2013. The company, subsequently, appeared on Dragons Den. last year, albeit it, purely, as a PR exercise. The Opus is built by Purple Line, the caravan accessory designers and manufacturers. A few years ago, the company decided that they should not just design for the recreational vehicle market, but, actually, get involved with it, and the Opus Camper was conceived. The Opus Camper is, unusually, a five berth folding camper, but with a traditional six berth camper layout. The reason for the loss of one berth is that the U shaped seating area, in the Opus, only makes up to a single bed, as opposed to the, more traditional, double of its competitors. Internal layout of the Opus; (1) Beds, (2) Sink, (3) Work surface, (4) 2 burner hob, (5) Seating area with optional single bed. (6) Table, (7) Storage / Porta Potti cupboard (8) Storage, with fridge over. The layout of the Opus is exactly the same as most, if not all, six berth models on the market, today. Entry is via a near side door, towards the front of the camper. To your left is a small storage cupboard, beyond that, the first double bed. Directly opposite the door is the kitchen unit, and to the right of the door, a second storage unit. Towards the back is the U shaped seating area, and, beyond that, the second double bed. The layout is where the similarity with other models largely ends, and you can very much see that it was built by a team of ‘designers’, as it does have one or two issues in terms of practicality, but more on that later. The Opus Camper is extremely sturdy, and is, actually, the heaviest model available on the UK market. Weighing in at 1,050kg, for the basic model, it is 50kg heavier than largest competitors the Pennine Pathfinder and Conway Crusader. Not only is it the heaviest, though, it, also, has an pretty impressive payload. At 250kg, it is 70kg more than that of the Pathfinder’s 180kg limit. When folded, the Opus is 416cm long (including tow hitch) x 195cm wide x 127cm high. Once opened out, on site, it is 580cm long, with both beds extended, x 127cm wide. Opus were, originally, a little economical with the truth when it comes to the dimensions of their ‘full awning’. It was quoted as 620cm x 240cm. Sounds very impressive, until you realise it was considerably shorter than the main trailer unit. The latter is only 580cm long, so how can a much shorter awning be 620cm? It would appear that the answer lies with the optional extension pods. A little naughty, when you bear in mind that these add a further £398 to the price of the awning. The latest version of the brochure has now been amended, and the full awning is now sold, with pods included, however, the price has increased, still further, to a whopping £1,499. I have to say, I really love this camper. The main reason I love it, however is that it is just so cool, and different from anything else on the market. Unfortunately, therein, also, lies its core weakness. The Opus Camper is a designer’s dream, but I can’t help feeling, in certain areas, it is a triumph of style over practicality. It looks undeniably brilliant, but how usable is it on a day to day basis, and how much is this exclusivity going to cost us? These are just the basic extras, and take the cost of, even, a standard model to £15,689. Compare that to something like the latest Pennine Pathfinder, at £13,995, and you start to realise just how far behind the Opus is, in terms of equipment levels. Almost £2,000 more, and it has no toilet, oven, or, even, hot water. Fortunately, it’s not as bad as it appears. Opus, also, offer a range of other variants on the model, up to the ‘Full Monty’ incorporating a wealth of options, including the full awning and leatherette seating. At a cost of £14,995, this represents, according to Opus, a saving of £2,610 on retail value. It’s still £1,000 more than the Pathfinder, though, and, still, without a proper toilet or hot water. On the subject of extras, the overall list is pretty impressive, with many extras being unavailable in any other model on the market. Once again, though, some of them will put a pretty sizeable hole in your pocket. This is far from an exhaustive list of options available for this model, and you could spend well over twenty grand on one, without running out of extras to buy for it. OK, so, back to the every day basics of the camper, and what it’s like to use. As mentioned, above, the Opus Camper could be described as a bit of a triumph of style over practicality. So. what does that mean in reality? Well, firstly, there is no denying that the Opus is one cool camper, and a great space to relax in. Another great thing about it is the interior height and head room. The main cabin height is 244cm max, or 8 foot. Most folding campers struggle to get over 6 foot of headroom. Add this to the clear plastic roof lights in the Opus, and it really does give an airy and spacious interior to the cabin area. I can’t help feeling, though, that the Opus canvas always looks like it doesn’t quite fit. I think this is, probably, just down to the fact that all other folding camper models are set up in such a way as to pull the canvas taut over the main frame. The Opus doesn’t comply with this ‘norm’ and sits in a far more casual manner across the light weight aluminium poles. At the end of the day, I think the appeal, or not, of this will, largely, be down to the individual user. Storage in the Opus is adequate, but not great. There is plenty under the main seating area, but the kitchen and cupboards either side of the door are a little lacking, compared to other models. There is a small cupboard to the left of the door, as you walk in. There is an option to have this replaced with a ‘toilet cubicle’, however, this is little bigger than the porta potti it comes with, and not practical to use as an actual toilet area, simply to store one in. Storage in the kitchen area, although reasonably comprehensive, is mainly comprised of open shelving, designed to house storage baskets, or similar. There is also space for the optional (£99) microwave. Kitchen equipment, also, leaves a bit to be desired, in a camper with this price tag. There is, as standard, a two burner hob (no grill) and sink, with no hot water. On that note, I did speak to Opus, last month, and they assured me that hot water is very much on the wish list for the near future, so that will be a bonus, if / when it happens. A Dometic fridge is an option, at £349. Unfortunately, however, it sits on top of one of the cupboards, thereby losing the available surface space of that cupboard. That wouldn’t be an issue, if the fridge were not top opening, meaning that anything stored on top of it must be moved every time you wish to gain access to the fridge. Although there is no hot water in the Opus, it does have an electric blown air heater, mounted into the kitchen unit. This heater, along with the insulated aluminium trailer panels and heavy duty poly cotton canvas mean that this camper is reasonably well equiped to deal with some of the more inclement British weather. The awning of the Opus is, to say the least, unusual. It is only the width of the main trailer body, but is extended to the full width of the camper by the addition of two extension pods. These are no longer optional, so the awning is a pretty expensive option, considering the actual available living area in it is far smaller than comparable models. In a seemingly tireless attempt to re design the marque, regardless of practical application, Opus have brought out a number of variants, with varying degrees of success. The first, and most practical, of these was the Opus Drifter. This is, basically, an off road version of the camper, which was designed, primarily, for the Australian market, where it seems to have been reasonably well received. Another experimental model, which is yet to hit the mainstream market was the Opus Moto. This model was designed specifically for the moto cross market. Its chassis was up rated to allow it to carry two moto cross bikes on top. It, also, incorporates a 500kg crane, to lift the bikes on and off. This crane then folds away inside the camper, when in transit. Who on Earth ever thought that would be a good idea? (Style over practicality again). Firstly, the market is relatively niche for a folding camper, especially when most involved in the sport prefer to transfer them in a standard van, or on a standard trailer. Secondly, having a crane that folds inside the camper means that you, automatically, lose the only decent sized storage area in the whole camper, and, thirdly, the up rated specifications takes the gross weight of the Opus Moto to a whopping 1,550kg, meaning that most people who would tend to use it are unlikely to be able to tow it on their post 1997 driving licences, not to mention the large number of smaller cars that would struggle to legally tow it. Great planning there, Opus. The most recent, and, potentially, equally poorly conceived, model is the AiROPUS, which was announced earlier this week, and is scheduled for release in 2017. This is a self inflating canopy for the main trailer, which allows the AiROPUS to self erect, to a certain extent. Like most things Opus, it looks really cool, and your first impression is, usually; Wow! I want one”! Then you look at what it actually does. You still have to open the bed boards out manually, and attach the canvas, yourself. Basically, the air system inflates the air beams and tensions the canvas. Hold on. Isn’t that what we do when we push the main poles up? So we are paying goodness only knows how much to automate a process that is, perhaps, the easiest part of the whole procedure, and only takes a matter of seconds, anyway. Oh dear. It’s a little bit like buying a ‘self driving’ car, and then finding out that all it, actually, does is operate the indicators for you. The Opus Camper is, undoubtedly the coolest folding camper on the market, at the moment, but, boy, does that come at a cost? There are some really nice features, like the leatherette seating, and huge eight foot of head room, but you have to seriously question the logic of any company that provides a £1,000 home cinema as an optional extra, but can’t muster the basics, like hot water or a ‘proper’ toilet. The Opus design is inherently flawed in so many ways, and, yet, to many, that simply wont matter. In the same way that the average Lamborghini driver is unlikely to be worried about rear visibility, or space for the shopping, I suspect that Mr and Mrs Opus are unlikely to be overly phased by its apparent short comings. If you love the Conway and Pennine models, you will, probably, hate it, however, if you find traditional folding camper styling a little less than exciting, and you have very deep pockets, the Opus Camper may well be worth a closer look. Personally, whilst I’m very much aware of the limitations of this model, I can’t help feeling more than a bit of love for it. That said, given fifteen grand to spend, I would be straight down to Pennine, for a new Pathfinder, plus a bit of left over spending money. Fortunately, for Opus, though, we aren’t all the same. If you think the Opus Camper might just be what you are looking for, why not rent one for a night, under their ‘try before you buy’ scheme, which includes a camper and pitch at their North Essex camp site. The cost, of £100, for a night, is refundable against any subsequent purchase of an Opus Camper, so you can’t say fairer than that. If you’d like to know a little more, feel free to check out their main web site, or give them a call on 01473 601200. You can, also, check out the Opus Page on our Web Site for more model details, and a number of videos. If you want to check out the release video of the AiROPUS, you can do so here. The Pennine Pathfinder is the flagship model in the Pennine range, and has been since its introduction in late 1998. It came in various guises, including a number of other names, like the Trailfinder and the Pentium. The Pathfinder, itself, mainly came in two versions, the TC and the DL. The TC was the more basic version, standing, simply, for Toilet Compartment, whilst the DL, or Deluxe, included a number of extras, the most noticeable of which was a full oven. The Pathfinder is a six berth model, with a comprehensive range of equipment, unmatched on the UK market. In terms of layout and equipment levels, the modern Pathfinder is, largely unchanged from the very first model to roll off the production line. The largest of the six berth berth offerings, the Pathfinder features two fixed double beds, plus a third which can be made up from the dinette seating. Entering from the near side door to the Pathfinder, immediately on the left is a three way fridge, with wardrobe over. Behind that is the first of the fixed double beds, running across the front of the camper, over the A frame. Opposite the wardrobe is the washroom / toilet compartment, featuring an electric flush Thetford cassette toilet and drop down sink with hot and cold water. Beyond the washroom, heading towards the rear of the camper is the kitchen. This features a three burner hob, grill, and, in most cases, a full oven. Behind this is a small shelf unit, and, to the side, a sink, with drainer, and large storage cupboard under. There is, also, a further cupboard / drawer unit opposite, adjacent to the door. Moving towards the rear of the camper, we, next, come to the seating / dinette area, and, finally, the fixed rear double bed. Set up, on site, the Pathfinder is a full six metres long by over 2 metres wide, and the optional awning more than doubles this living area. In spite of this huge size, the main camper can be set up in around 15 minutes, with a further 30 – 40 minutes for the awning. Not only is the Pathfinder the largest domestic model available, it’s, also, the heaviest. Standard models have a gross weight of 1,000kg, with some specials rising to 1,049kg. With a net weight of 820kg, this gives the average Pathfinder a payload of a reasonably generous 180kg. As mentioned above; the on site dimensions of the Pathfinder are 6 metres long, by 2.12 metres wide. The awning is 6.2 metres by 2.5 metres. This gives a total usable space, in the region of twenty seven square metres. Full specifications for the Pathfinder, as well as copies of all relevant paperwork (manuals, sales brochures etc) can be found on the Pathfinder Page of our main web site. The Pathfinder is a generous six berth folding camper, however, at the risk of being repetitive, just like the rest of the range, their maximum berth capacity is better appreciated when used in conjunction with the optional awning. 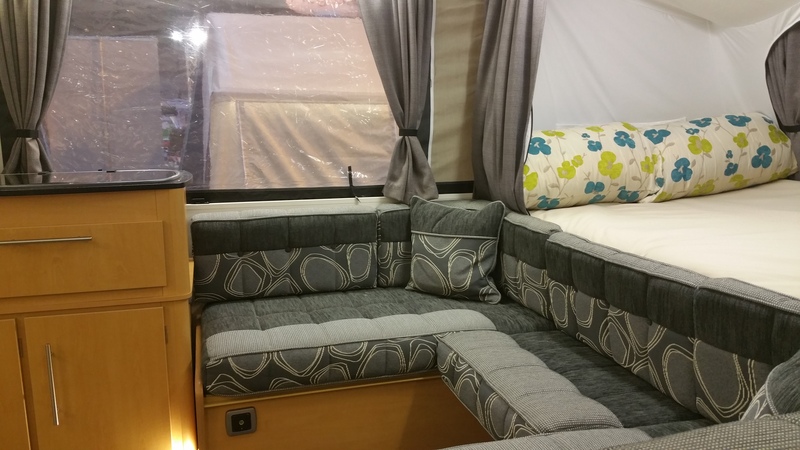 Whilst offering a more than competent 6 berth layout, without the awning, it is going to feel a little cramped inside with 6 people, especially as the dinette is better suited for 4 to dine and relax in comfort. The other minor annoyance is that the third double bed, which is made up from the two settees, is directly alongside one of the fold out double beds. This is only really an issue at night, when the occupants of one bed will need to climb over those in the other bed, in order to access the facilities. These issues, although minor, mean that the Pathfinder really comes into its own as a spacious four berth unit. In this capacity, there is very little compromise in terms of the facilities offered, once the unit has been set up, with comfortable seating and dining for four, two fixed, permanently made up double beds, more than adequate storage and a well equiped kitchen and washroom. The level of space and equipment just can’t be matched by standard tents or caravans with a similar footprint. The only thing lacking in a Pathfinder, when compared with an average caravan is a shower, as water and camper canvases have never been the most comfortable of bed fellows. On later versions of the marque, however, there is an external shower point, for those wishing to take advantage of it. Whilst most models come with both heating and hot water, only certain older models were dual fuel. The current Pathfinder models feature 240V mains versions, only, which is, perhaps, a bit of a retrograde step. Personally, I have a 1999 Pathfinder, and I love the fact that the hot water etc works off the gas, for when electric hook up isn’t an option. One thing that has improved, significantly, is the introduction, in 2012, of the Isabella acrylic trailer and awning canvases. These are more water repellent, and, hence, dry more quickly than traditional cotton canvases. They are, also, better insulated against external thermal fluctuations. Beds in the earlier Pathfinder models were more than adequate, comfort wise, however, later models are even better, with ‘proper’ domestic style sprung mattresses. Pennine are, however, a little economical with the truth (and they aren’t alone in that) when it comes to the size of the beds. These are referred to as a ‘double’ at the rear, and ‘king size’ at the front. In reality, however, the rear bed is 4′ wide, making it, officially, a ‘small double’, whilst the front bed is 4’6″, making it a ‘standard double’. A genuine king size bed is 6″ wider, at 5′. The Pathfinder has a very generous allotment of 12V lighting, especially compared to other models in the range. Fellow 6 berth models, like the Pullman and Sterling, normally, feature one 12V light, above the mirror, on the side of the wardrobe. In contrast, the Pathfinder has four of them. As with the other models, there is one on the wardrobe, above the mirror. There is, also, one on the side of the kitchen shelf unit, another in the wash room, and a fourth on the opposite side of the wardrobe, which serves as a dedicated light for the main bed compartment. Later versions of the model also feature a couple of spot lights on the underside of the shelf unit, over the kitchen. The main dining table can be left permanently set up, or stowed on one of the beds to give you extra space. It can, also, be set up, permanently, in the awning. Storage is pretty extensive in this model. There are two large lockers under the bench seating, a large cupboard, or two smaller ones, in the kitchen, with further cupboard / drawer opposite and wardrobe over the fridge. Some models, also, have a small cupboard under the oven, whilst others have a plinth heater mounted there. On models with no oven, the oven is replaced by a further storage cupboard. There is, also, a full width gas / storage locker at the front of the camper. Seating configurations in the Pathfinder vary, depending on year. There are three main options; (1) a four seater dinette arrangement, with large cupboard between the dinette and the door, (2) a five seater dinette, with two seater settee next to the kitchen unit and a three seater one opposite. Consequently, the cupboard unit by the door is correspondingly smaller. (3) The final option, which includes the current model, is a U shaped seating arrangement, along with the smaller cupboard. The Conway Crusader is, also, worth a mention, in this context. It is no longer an official current Pennine model, and is classed as a ‘show only’ model. It is, however, effectively, a customisable version of the Pathfinder. The trailer and canvas are identical, but the Crusader allows buyers to pick and chose from a menu of options and equipment, internally. The main distinction between the standard Crusader and the Pathfinder is that the Crusader has the traditional style dinette seating. The Pathfinder is the flag ship model of the Pennine range, and rightly so. Equipment levels are unparalleled within the folding camper fraternity, and, yet, older models can be picked up for a very reasonable figure. Our own Pathfinder cost just £1,000, and sub £1,500 examples are becoming increasingly common. At the other end of the scale, a brand new Pathfinder, with full awning, at the time of writing, can be bought for £13,595, all in, including full awning and VAT. Whatever your budget, folding campers don’t get much better than this, so definitely worth a look.